If you already have a VIZIO tablet you now can subscribe to Hulu’s subscription service. With it you will get a wide array of TV programs and movies for just $7.99 a month. This movie service will give you access to current and past season of Modern Family, The X-Files, Arrested Development, the Family Guy and much more. VIZIO was just released across the United States last month. It is designed to offer an optimal entertainment experience while according to VIZIO focusing on “Entertainment Freedom“. One feature of this tablet running Android Gingerbread 2.32 is its three-speaker configuration that provides enriched audio landscape as well as portrait functions. With VIZIO’s entertainment system you have access to a universal remote and a HDMI (High-Definition Multimedia Interface) port for HD playback on your television at home. 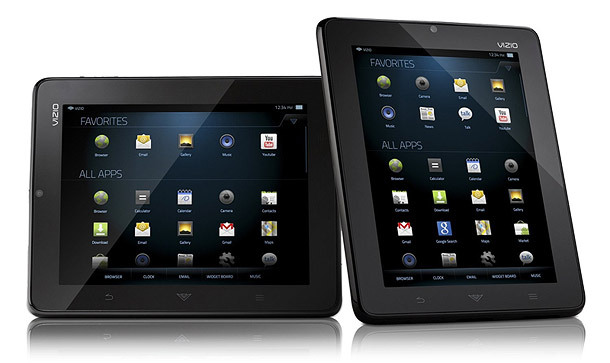 Selling for under $300 makes it one of the best buys on the Android tablet market. Check the specs and official Press Release below. IRVINE, Calif., Aug. 24, 2011 /PRNewswire/ — VIZIO, America’s #1 LCD HDTV Company*, announced today that the new VIZIO 8″ Tablet with WiFi will support the Hulu Plus™ subscription service. The highly-anticipated app will bring the extensive library of TV and film content from over hundreds of providers and independent creators to subscribers using the VIZIO Tablet for just $7.99 per month. Allowing users to find and enjoy premium content on their own schedule, the Hulu Plus™ subscription service complements VIZIO’s mission to bring high-quality technology and “Entertainment Freedom™” to consumers at an extraordinary value. The subscription service offers instant access to current and past seasons of shows like 30 Rock, Modern Family, The X-Files, Arrested Development and Family Guy. Last week, VIZIO’s feature-packed, multi-media Tablet hit retailers nationwide at a price of $299. Designed with “Entertainment Freedom” in mind, the WiFi enabled VIZIO Tablet comes equipped with unique features like a three-speaker configuration for enhanced audio in landscape or portrait modes, built in universal remote app for home theater control and a HDMI® port for HD playback on the big screen. The addition of Hulu Plus bolsters the entertainment value of the sub-$300 VIZIO Tablet, making it one of the most affordable, media centric, Android-powered Tablets on the market. According to early 2011 data from the Nielson Company, video streaming increased by 28% from last January. Not only are more people using video streaming, but 45% of viewers are spending more time watching the content they selected. With more consumers choosing to view content via non-traditional channels, VIZIO viewed this as an opportunity to create a Tablet with an industry leading media-centric experience.